So you're engaged… first off, congratulations and welcome to one of the most exciting times of your life! We might be a little biased around here, but the wedding world is one of the happiest and most fun places to be, and loads of us are thrilled to share it with you. This is one "club" that everyone is invited to join! With dreams of sparkles and rings dancing around your head, reality probably whammed you the moment you got back to your 9-to-5 job and now you're going "Oh shoot! Where the heck do I even begin planning a wedding?!" We got your back, newly engaged friend. Not only is this website a great resource for planning your local wedding, but we're making it super easy to get started. There are five vital things to do before you do anything else! So get your Pinterest button ready! 1. Announce your engagement to your family and friends. Whether you're a social media maven or a classic hostess with the mostest, share the good news. Many couples get creative with cards, Instagram shout-outs, or even place cards at dinner parties. No matter how you do it, be loud and proud. 2. Set a date and budget. Not just because the date will carry significant meaning to you for the rest of your life, but it's the jumping board to deciding everything in your engagement. From venues to parties to planning a budget, having a date or a specific weekend in mind will help you formulate your life's timeline. 3. Find and book your wedding venue. Before you get that dress and those ribbons in your perfect shade of blue, get that venue! With more and more couples booking far more in advance, you want first dibs on your dream location. If you dream of a May, September, or October wedding, be prepared to potentially be flexible with your wedding date; these are some of the most popular months in Hampton Roads to get married. Some venues have even been booked a year in advance... before you even had a ring on that finger! 4. Consider hiring a wedding planner. With finding your dream vendors and details, a planner can work with all budgets and find shortcuts to make the planning process stress-free and smooth sailing. Five years later, it's still my number one regret from my own wedding. Think a planner might be out of your budget? That's actually a huge misconception the newly engaged have as the planner can actually save you money. So whether you go day-of coordinator or full-service from start to finish, the planner can be your greatest asset. 5. 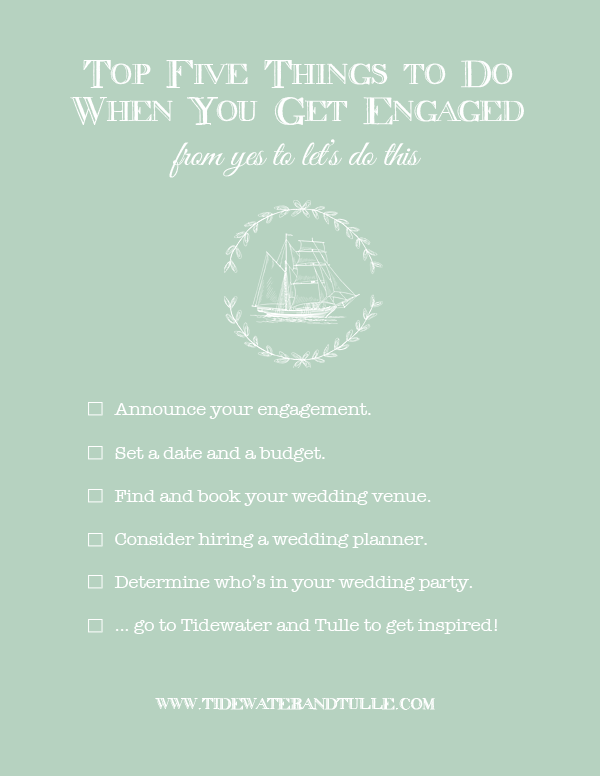 Determine your wedding party and propose to them. The men and women you ask to stand with you on your special day are your greatest supports throughout your entire engagement. Not just for bridal showers and bachelor parties, these people will be there when Scary Cousin Twice Removed Mable invites herself to your wedding, when your dress feels a little too snug or too loose, and when you ugly cry when reality hits that you really do feel like a beautiful bride. Getting married is a rite of passage in our culture, and that emotional support is such a lovely thing. What are some things you're most excited about to plan for your wedding? Share below in a comment!